The bass does have a good bit of nicks and scratches but its a super solid built bass. The pickup toggle switch works but it seems a little loose and might need to be replaced. Sweetwater is an Authorized Yamaha Dealer. There is light scratching on the top of the guitar, bass side, near the cutaway. There are other fine scratches on various parts of this guitar that are not shown in the pictures. Yamaha BB-605 5 String Bass with the Nathan East EQ in Natural Finish. These were only made for a few years, and not many around. Active EQ that was designed with Nathan East, and sounds fantastic. Plays great, has been set up and adjusted by Pro Repair Tech. NO Case or Gig bag! Yamaha BB1025X 5 String Bass with 18v Preamp and Hardshell Case Excellent!! There are no issues with the bass, it's frets have very little wear, and the overall condition is near-mint. There is also a hardshell case included. These instantly recognizable basses are a great alternative to the norm - and this BB434 is a great value too! It also features lightweight open gear tuners and a unique multi-point pickguard. Part Number: BB434 TBS. YAMAHA BB-N5 5-string Bass, FLAWLESS, MINT CONDITION! LOOKS AND PLAYS GREAT! THIS IS A FLAWLESS YAMAHA BB-N5 BASS. MINT CONDITION, BEAUTIFUL GUITAR, NOT A CHIP OR SCRATCH ANYWHERE! THIS NEEDS TO BE ENJOYED AND PLAYED, NOT SIT IN MY COLLECTION. I DON'T WANT TO SCRATCH MY NICER ONES SO I DON'T PLAY THEM. 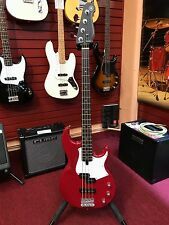 1978 Yamaha BB800 Bass Guitar, Cherry Finish , All Original w/Hard Shell Case. Condition is Used. Shipped with UPS Ground. This item is slightly used and has been thoroughly checked out by our experts to make sure it is in perfect working condition. This item is covered with a one year warranty from Sam Ash. Yamaha's 6-Bolt Miter Neck Joint holds the neck closer and tighter to the body fusing these two separate components into one. Truss rod works and turns easily and smooth, so the electronics. Markley's but ( B string is from another set), bass looks nice and play great. to grab this nice bass as they are great value and known for best sounding basses. This has small scratch marks or paint peeling and dent, but not obtrusive much, Nice condition. I will try my best to resolve the issue. Lightweight Tuners. The New BB models feature a slightly thinner neck than previous BB basses, improving playability and feel for both modern and traditional players. New Neck Shape. This BB234 4-string electric bass guitar puts all the legendary attributes of the originals into a straightforward passive design that is both inspiring and affordable. Body Color: Natural. Body Style: BB. YAMAHA BB604 4 string Bass guitar Nathan East model natural finish GREAT TONE!! From my personal collection and batch. finish, This is the closest sound to the Nathan East Model. Bass has a very comfortable neck, it has a clear piano tone and very punchy when it's needed. CONDITION: Bass is used RATED 8/10. Yamaha BB735A Active 5 String Bass w/Bag. Bass Amplifiers (27). Guitar Amplifiers (17). Guitar Effects (1). Miter bolting holds the neck closer and tighter to the body fusing these two separate components into one. MPN: BB234 YNS. The perfect sound?. Versatility?. Durability?. All of the above and so much more. Yamaha has spent decades working closely with artists who practice their craft at the highest levels of recording and live performance to help them forge a clear vision of what musicians demand of their bass in every capacity. Alder / Maple/ Alder Body Construction. Body Materials: Alder / Maple / Alder construction. Neck Width @ 0 Fret / 12th Fret: 43.0 / 63.9 mm. Thickness @1st Fret / 12th Fret: 20.5 / 22.5 mm. Body Finish: Dark Coffee Sunburst : Gloss Polyurethane. Neck Width @ 0 Fret / 12th Fret: 40.0 / 56.3 mm. Thickness @1st Fret / 12th Fret: 21.0 / 23.0 mm. 3-Band Active EQ. Body Finish: Matte Translucent Black. Bridge Pickup: VSC7b : Single Coil / Alnico V.
This BB434 4-string electric bass guitar puts all the legendary BB bass attributes into a clear-sounding passive design that is both inspiring and affordable. If you want a modern and affordable take on the BB bass, the BB434 4-string is for you. The New BB models feature a slightly thinner neck than previous BB basses, improving playability and feel for both modern and traditional players. New Neck Shape. This product will include the manufacturers full warranty. The 34” scale maple neck features a fast, ultra-comfortable profile and a rosewood fingerboard. We strongly suggest that you check your order after receiving it to be sure that it is in proper working order. MPN: BB234 YNS. Yamaha BB234 Electric Bass Guitar - Yellow Natural Satin - QTY 1. Yamaha BB series 4-string electric bass guitar in yellow natural satin finish. This is an excellent learning tool for any beginning bass player. New Neck Shape. This product will include the manufacturers full warranty. Lightweight Tuners. YAMAHA BB-1200 '78 "Made in Japan"
Sweetwater is an Authorized Yamaha Dealer. There are fine scratches on various parts of this guitar that are not shown in pictures. These fine scratches do not show up well in pictures. Discontinued products, closeouts, and used products. MPN: BB235 VW. This is an excellent learning tool for any beginning bass player. This basic black strap is a great match for any acoustic guitar, electric guitar, or bass guitar. What's included in this bundle. A quality vintage instrument. Simple configuration that can deliver a variety of tones and sounds depending on playing style. Small amount of belt rash on the back and a scuff on the neck at the seventh fret. Comes with leather Yamaha case. MPN: BB235 YNS. Yamaha BB235 Electric Bass Guitar - Yellow Natural Satin - QTY 1. This basic black strap is a great match for any acoustic guitar, electric guitar, or bass guitar. This is an excellent learning tool for any beginning bass player. She has her dings and signs of wear but she plays great, sounds great, everything works. This BB234 4-string electric bass guitar puts all the legendary attributes of the originals into a straightforward passive design that is both inspiring and affordable. Body Color: Raspberry Red. Body Style: BB. This BB235 5-string electric bass guitar puts all the legendary attributes of the originals into a straightforward passive design that is both inspiring and affordable. Whether you're a session player or a specialist, you know the benefits of a P/J pickup combination. Yamaha BB 450 - made in 1980's. bought the guitar from the original owner. However, neck is in great shape. Guitar plays and sounds fantastic. This BB234 4-string electric bass guitar puts all the legendary attributes of the originals into a straightforward passive design that is both inspiring and affordable. Whether you're a session player or a specialist, you know the benefits of a P/J pickup combination. Yamaha BB735A 5-String Electric Bass Guitar Dark Coffee Sunburst. The new BB body features an Alder/Maple/Alder multi-laminated body construction. The hard maple center increases body stiffness and accentuates midrange to cut through the mix of a band, and allows a more uniform transmission of vibrations between the body and the maple neck for unparalleled resonance and sustain. SKU :UY4983185. Active or Passive: Passive. Body Wood: Alder. Weight: 8.8 lbs. Inlay Style: Dot. Fretboard Wood: Rosewood. Neck Type: Bolt On. Neck Wood: Maple. Matte Translucent Black Finish. 20 Narrow Tall Frets. Serial Number: HNM033200. Most of our guitars are individually photographed, and are set-up with care by our in-house luthier. Part Number: BB734A TMBL. YAMAHA BASS ELECTRIC GUITAR BB2000. Good credit, bad credit, or no credit – everyone is approved to rent from Castle! Type of Bass Guitar ELECTRIC. Number of Strings 4 STRING. Dexterity Not Specified.